Two seemingly reasonable principles guide German thinking about eurozone integration: responsibilities and control must be aligned; and legacy risks must be settled before any pooling of risks among euro members takes place. But what if France applied Germany’s approach to eurozone integration to the question of mutualizing defense commitments? Two mantras guide German thinking about eurozone integration: responsibilities and control must be aligned (so no mutualization of risk without shared jurisdiction); and legacy risks must be settled before any pooling of risks among euro members takes place. Since 2010, these two refrains have shaped the entire discussion of how to shore up the euro, and they largely account for the anemic progress being made on the creation of a European banking union. Germany is ready to embark on a common future, its leaders say, but only if Europe starts from a clean slate. At first sight, that proposition seems reasonable enough. But to understand its full implications, try applying the same logic to another policy field: security and defense. What if France applied Germany’s approach to eurozone integration to the question of mutualizing defense commitments? What if the French were to insist, as an absolute precondition for further security cooperation, that Germany not only increase its defense budget immediately, but also make good on its accumulated backlog in defense spending from recent decades? Germany has not always been a free rider on other people’s defense spending. West Germany was a reliable player in NATO’s Cold War system of burden sharing, and the Bundeswehr in the 1980s was a capable force. For better or worse, it stood in the tradition of German armies since the Kaiserreich. National service was the norm. Defense spending ran at 3% of GDP. Then came the fall of the Berlin Wall in 1989. Germany embraced the peace dividend with a vengeance. Reductions in Germany’s armed forces and disavowal of weapons of mass destruction were written into the treaties that reunified Germany. But demilitarization also reflected societal shifts. Something in the political culture of the Federal Republic had changed. More and more young men chose civilian over military service. In 2011, conscription was suspended. As a practical matter, that decision probably should have come sooner. Today’s best-functioning militaries are professional, not conscripted. But, in Germany, no positive image of the Bundeswehr’s new role emerged from the end of the Cold War model. Morale and functional capacity collapsed along with spending. At NATO meeting after NATO meeting, Germany would commit to spending 2% of its GDP on defense. It never delivered. Spending slumped toward 1% of GDP, with the majority going to salaries and pensions. The latest NATO data show German spending on defense equipment and on research and development running at only 0.17% of GDP in 2017, compared to 0.42% in France and 0.47% in the UK. Germany’s dearth of military investment has created a daunting gap between its defense capacity and that of the rest of Europe. Only a fraction of Germany’s weapons and military vehicles are operational. On Europe’s eastern border, only nine of the 44 tanks promised for the Bundeswehr unit that is supposed to anchor NATO’s 5,000-strong rapid-reaction force in the Baltics next year are fit for use. The unit also lacks other equipment essential for the mission, such as tents, winter clothing, night vision equipment, and body armor. For the German left, which opposes the use of hard power, there is no reason to lament this lack of resources. 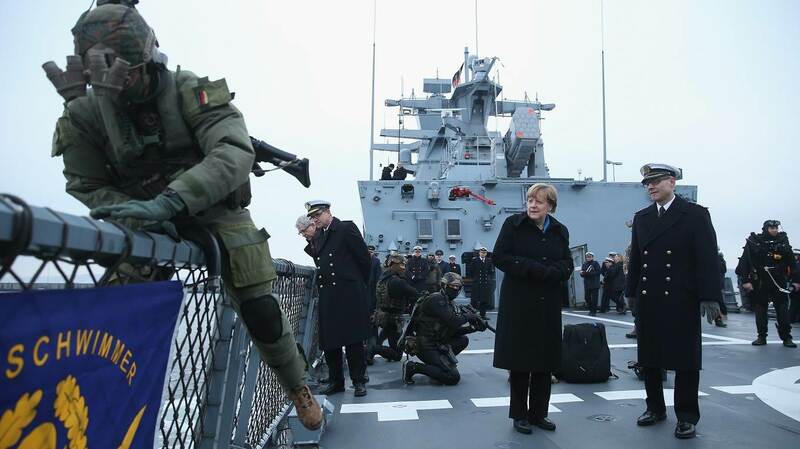 But the gutting of the Bundeswehr also disables Germany’s ability to exercise soft power. In 2014, Germany’s humanitarian team to deliver assistance to Ebola-stricken Liberia was stranded in the Canary Islands. The German Navy’s large supply ships – those most useful for refugee rescue operations in the Mediterranean – will be out of commission for 18 months, owing to a lack of spare parts. If the Bundeswehr’s guns don’t work, its frigates are in dry dock, and its logistical capacity is zero; what other commitments might the French taxpayer be taking on? By agreeing, year after year, to the mutualization of defense costs, what sort of incentives is France providing to Germany to undertake reform? If the French were to apply a simple spending rule, they would find that since 1990 they had cumulatively spent 30% of GDP more than Germany on defense. If what the Germans are most interested in is France’s nuclear deterrence, the costs over the same period total approximately 4.5-5 % of French GDP. So the legacy issues are considerable. Furthermore, given Germany’s ingrained post-military habits, backsliding is to be expected. What is French President Emmanuel Macron to make of the German budget announced earlier this month, which shows a marginal increase in defense spending but not enough to meet the NATO target, let alone to close past deficits? German Chancellor Angela Merkel’s new grand coalition government may not look like a reliable security partner, but does that mean France should hold out until Germany has made good on its legacy defense debt before considering defense investments and mutualization in Europe? Europe’s need to develop a twenty-first century security strategy is urgent, not only because Donald Trump’s America is unreliable, but also because humanitarian emergencies demand it. It must develop a shared culture and build democratic governance to decide on the deployment of its defense forces. That will involve deep cultural and political adjustments on all sides. Both Germany’s habit of free riding and France’s tendency toward trigger-happy postcolonial forays will have to be debated. These issues are at the heart of developing a European sovereign, backed by democratic institutions and decision-making processes that enable the common use of force. But Europe cannot start from some imaginary tabula rasa. It must start from the place to which history has brought it. The quid pro quo that France should demand for cooperation on security policy is that Germany recognizes the same reality with regard to economic policy. Here, too, the past must be taken as given. Starting positions are unequal and incentive structures are imperfect. But Europe must agree to move forward together nonetheless, or risk being torn apart.